The Technion-Israel Institute of Technology today announced it will celebrate Michael R. Bloomberg, three-term New York City Mayor, philanthropist and founder of Bloomberg LP, by presenting him with an Honorary Doctorate. He is being honored for his inspired vision in bringing the Technion to New York City, and for his role in transforming the future of education in the City. The event is sponsored by the American Technion Society, which provides critical support to the Haifa-based Technion, ranked among the world’s leading science and technology universities. 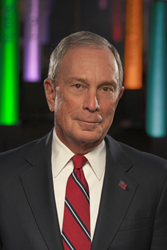 Mr. Bloomberg will receive the honor at the Technion Benefit Gala on Tuesday, March 15, at The Plaza Hotel in Manhattan. Acclaimed journalist Charlie Rose will serve as Master of Ceremonies for the evening, which will also feature a special performance from the renowned soprano, Renée Fleming, in concert with legendary Israeli pianists Leonid Ptashka and Gil Shohat. Mr. Bloomberg worked to position New York City to become the global capital of technological innovation. From 2007-2012, jobs in the City’s tech sector grew by 74 percent, making the City second only to Silicon Valley in venture capital funding for tech startups. In December 2010, the Bloomberg administration launched Applied Sciences NYC, a competition leading academic and research institutions from around the world to propose a new or expanded applied sciences and engineering campus in New York City. Winners would receive support from the City to make those campuses a reality. The winner was a partnership between Cornell University and the Technion-Israel Institute of Technology. As a result, the Technion is helping lead the way to diversify and strengthen New York City’s high-tech industry. Over the next three decades, the new applied science and engineering campus being built on Roosevelt Island is expected to generate 8,000 permanent jobs, 20,000 construction jobs, hundreds of new companies and more than $23 billion in economic activity. The evening will also celebrate the Technion’s role in creating a technology revolution in New York City, similar to the one it spurred in Israel, where Technion graduates have launched and led many of Israel’s major companies, including 59 of the 121 high-tech Israeli companies traded on the NASDAQ. Additionally, the Gala will highlight the achievements of some of the Technion’s highly successful innovators, including Shiri Azenkot, Joan and Irwin Jacobs Technion-Cornell Institute assistant professor whose research is enabling blind people to see through interactive technology; and Ran Korber, Technion alumnus and CEO of BreezoMeter, whose company is monitoring air quality for a healthier environment. The event will also showcase the work of Ester Segal, a Technion professor who is revolutionizing cancer treatment through nanotechnology; and Dr. Kobi Vortman, Technion alumnus and founder and vice chairman of the board of INSIGHTEC, an Israeli company developing breakthrough technology for the operating room of the future. The 2016 Technion Benefit Gala is made possible by the generous support of Gala Chairs: Lauren and John J. Veronis, as well as its Honorary Chairs: Joan and Irwin M. Jacobs, Eric Schmidt, and Joan and Sanford I. Weill. Additional support is provided by: BHI USA, Bank Hapoalim; Zahava Bar-Nir; Bloomberg Philanthropies; Canyon Partners, LLC; Laura Flug; Forest City Ratner Companies; Elaine and Ken Langone; The Ronald S. and Jo Carole Lauder Foundation; The Neubauer Family Foundation; Proskauer; Joanna S. and Daniel Rose; Julia and Joshua Ruch; Perri and Eric Ruttenberg; Jeanne S. and Herbert J. Siegel; Gillian and Robert Steel; and Ann and Andrew Tisch. For more information about sponsorship, individual tickets and more, visit TechnionGala.org or follow #TechnionGala across social media. American Technion Society (ATS) donors provide critical support for the Technion—more than $2 billion since its inception in 1940. Based in New York City, the ATS and its network of supporters across the U.S. provide funds for scholarships, fellowships, faculty recruitment and chairs, research, buildings, laboratories, classrooms and dormitories, and more. Visit ats.org or follow twitter.com/TechnionUSA to engage with us.